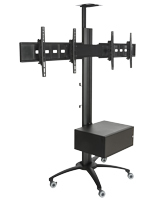 TV Size: fits most 32"-65" flat screens weighing less than 220 lbs. combined. 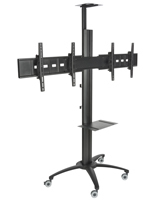 Dual mounting bracket shows two flat screens side-by-side for double advertising space. 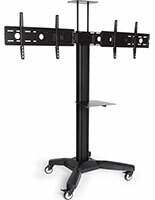 Extra tall height adjustable stand goes from 50" to 90" high at the center point of the mounting bracket. 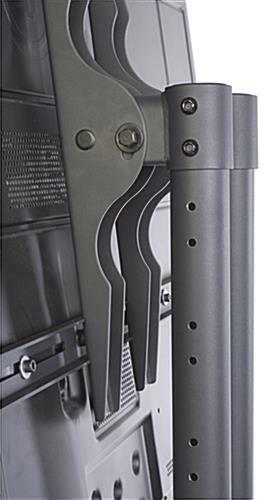 VESA compatible from 200mm x 200mm to 600mm x 600mm: 200mm x 200mm, 400mm x 200mm, 400mm x 400mm, 600mm x 400mm, 600mm x 600mm. 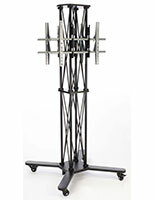 This dual monitor stand is height adjustable and can be set at the ideal viewing level depending on the use. The (10) pre-set height adjustments go from 50"h to 90"h. This LCD mount, dual monitor stand that showcases two 32"-65" flat panels is a hard to miss marketing device. This low-priced display provides twice the digital advertising space and high potential for a quick return on investment. 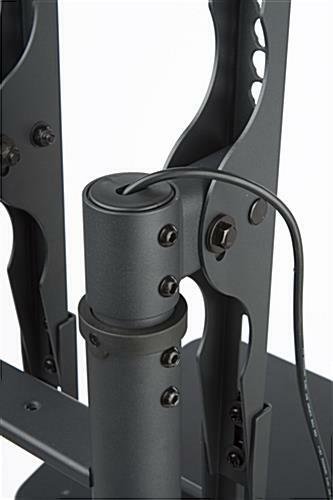 This dual monitor stand comes with two VESA compatible mounting brackets from 200mm x 200mm to 600mm x 600mm. 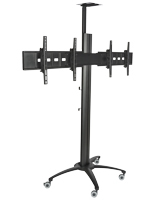 Flat panel monitors are a perfect mode of marketing and this plasma mount includes (2) brackets. 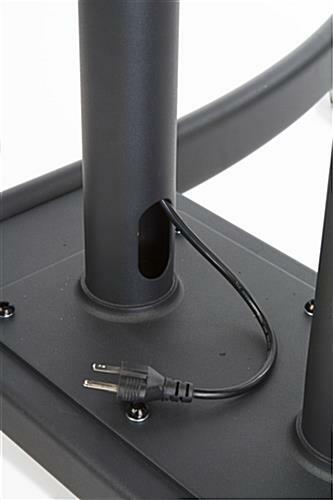 This LCD mount has in-post cable management to keep wires concealed and organized. This LCD stand ships knocked down with easy to follow instructions. 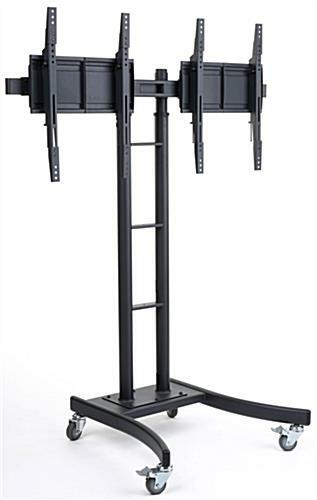 This floor standing dual monitor stand is great for businesses of all types. 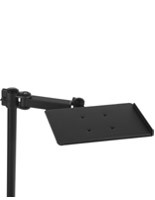 This dual monitor stand has a black finish that is long-lasting. The modern design suits many environments and can be seen at trade shows, in retail stores, at airports, and much more! This dual monitor stand is tall to tower over crowds of people for high visibility. These LCD mount displays come with the mounting hardware that fits most screens. 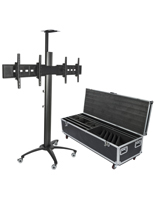 (2) Flat panels can be securely mounted with the steel mounting brackets. This display comes with a removable MDF shelf to hold a DVD player or other AV accessory. This dual monitor stand, called a plasma mount, has four wheels that lock. 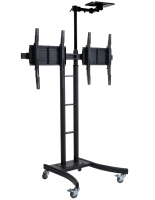 Users can roll this plasma display around nearly any establishment with the heavy duty caster wheels. This dual monitor stand that holds TVs in either portrait or landscape has many versatile features. 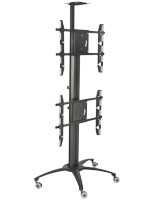 These TV holders have tilting capability so users can direct TVs to the best viewing angle. 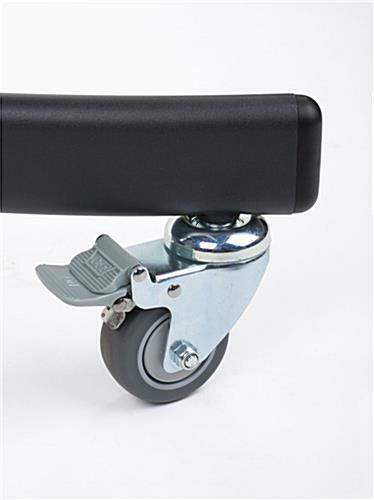 The locking wheels provide steadiness while in use. 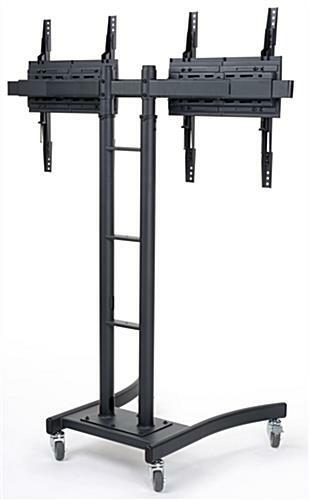 There is a huge selection of flat panel displays in addition to this dual monitor stand available in this online catalog. 31.3" x 6.4" x 31.3"